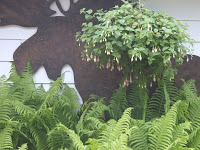 Today I watered the fuchsia hanging basket which has a robin’s nest in it. Somewhat later a robin came and stayed. I took its picture. 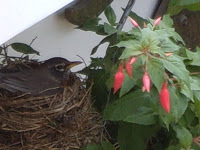 I also took a picture of another fuchsia hanging basket which is just to the right of the basket with the robin’s nest. This is more excitement for me. Two days ago I left home to do a long training walk of 11 miles. (My half marathon walk is in just one week from today.) When I returned home three of the four baby birds had flown away. The fourth flew away sometime yesterday. My feelings are akin to an empty nest feeling when our children left home for good. I wish I had been present when they left. Oh, well, I’ll get another chance to watch this new nest’s birds hatch and eventually fly away.